The Cheetah: fastest land animal on earth over short distances; can reach a speed of 120 kilometres an hour; measures two metres from the snout to the end of its tail; weighs between 40 – 60kgs; is the only cat with semi-retractable claws, and has a spotted coat. 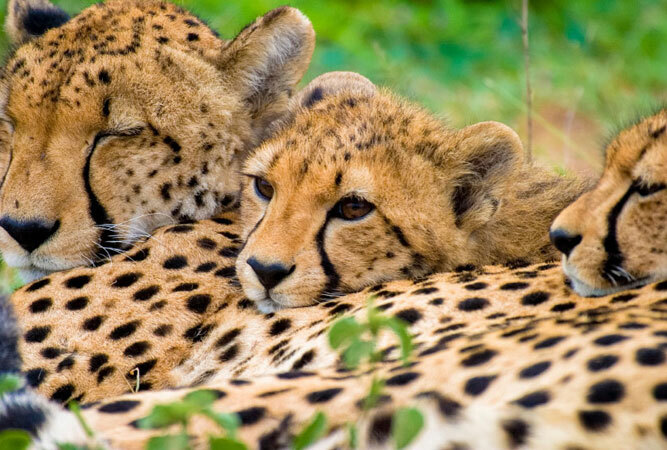 Cheetah are listed as Vulnerable, and Critically Endangered in North Africa and Asia. 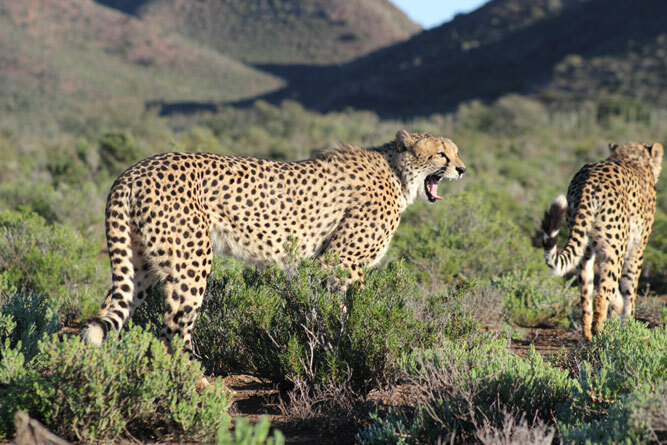 Visit this sanctuary for Africa’s endangered cats in the heart of the Karoo. The project has bred 100 cheetahs in captivity to ensure their survival. They are hand-reared. Handling and touching cheetah cubs, as well as Bengal tiger cubs (also bred at the project) is perfect for children, whilst encounters with fully grown cheetahs and tigers is possible for adults. All funds go towards breeding and conservation. An education and outreach programme to raise awareness about the plight of the cheetah, the project is set on land provided by Spier Wine Estate (combine a visit with wine tasting). The programme breeds and trains Anatolian shepherd dogs to protect flocks of sheep from predators like the cheetah. They are given to farmers as a way to ensure that cheetahs find other sources of food on farms, and thus survive. All funding for the breeding and training of these dogs comes from visitors to the project. Tour guides are knowledgeable and informative. Another breeding centre for the cheetah, this project on the Garden Route plays an important part in cheetah conservation. 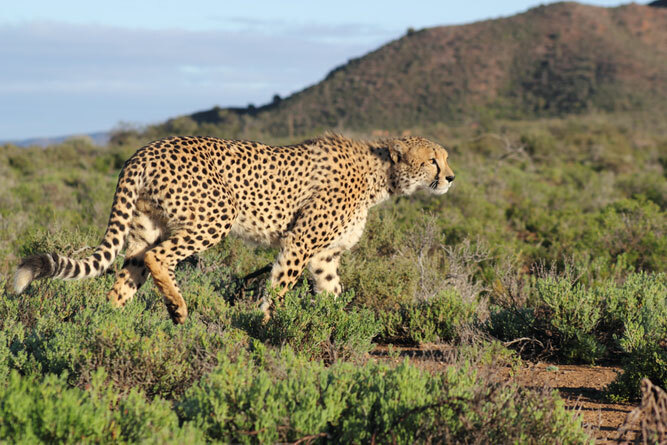 They recently introduced a very popular cheetah walk that allows visitors the chance to accompany cheetahs on foot through a safe area of the Garden Route Game Reserve, supervised by an experienced game ranger. The walk is 45 minutes and not suitable for children under the age of sixteen. 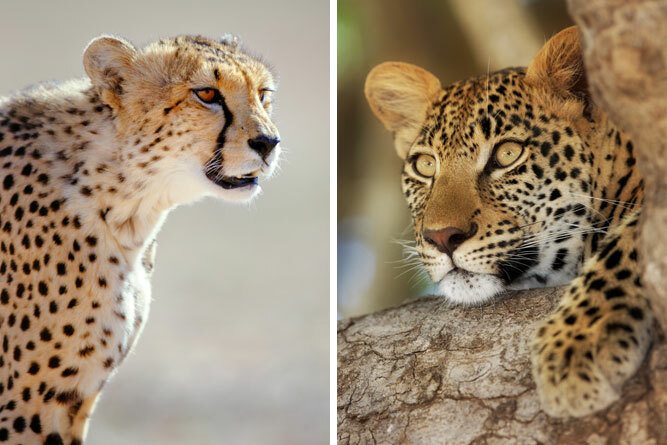 Experience educational tours through the project with trained tour guides who will teach you all about cheetah, but also about meerkats, black footed cats, servals, caracals, leopards and lions. As part of the one hour tour you will be able to enter an enclosure with a tame cheetah. There is also a one hour walk with two harness-trained cheetahs out in the African bush (no children under the age of 12). Now known as the Ann van Dyk Cheetah Centre (the recent name change is a tribute to Ann who has devoted her life to the survival of the cheetah), the De Wildt Cheetah centre lies in the foothills of the Magaliesberg. What began as a cheetah breeding project in 1971 now includes other breeding projects for the African wild dog, brown hyaena, suni, duiker, Cape vulture and riverine rabbit. The centre is the first to breed the rare king cheetah in captivity. Attend guided tours. 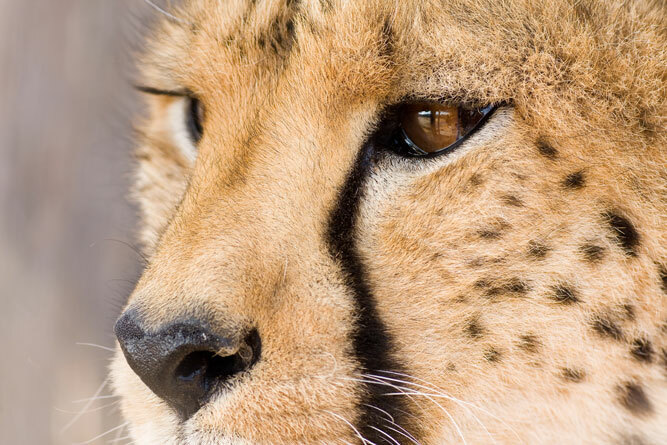 Find out more about cheetah habits, habitats and challenges facing their survival. Watch them run at full speed and pet, sit with and stroke a cheetah. This personal interaction (no children under 13 in the enclosures) is how the Dell Cheetah Centre raises awareness of the predicament of cheetahs, which they breed and re-introduce to the wild. Just two and a half hours from Cape Town is a 10 000 hectare reserve that serves as the base of the Western Cape Cheetah Conservation. See cheetah run and encounter tame cheetah as part of a guided tour. This is not a game park but a facility for endangered cheetah and some rescued animals – a few white rhino, a couple of elephants, lions, several giraffe, zebra and a couple of hippos. The cheetah experience is the highlight of any visit. The cheetahs at Kruger have proven that this carnivore is as successful a hunter in wooded areas as on open grassland plains, although research has shown that they prefer the open areas with adjoining woodlands in Kruger. The most recent census found 103 individual cheetah in the reserve, a stronghold if you consider that fewer than a 1 000 survive in South Africa (this figure includes those in zoos, breeding centres and private reserves). 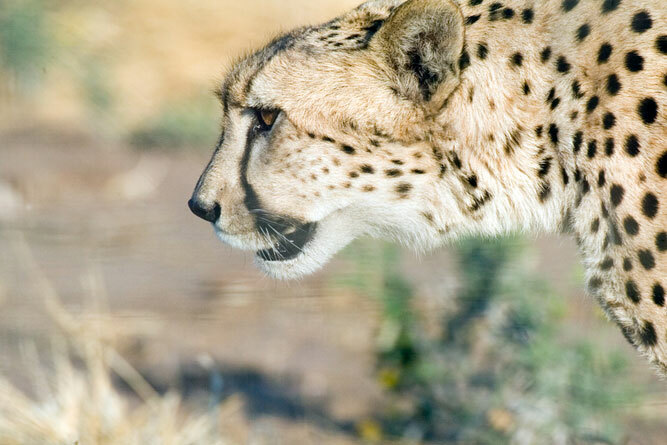 The Fiela Funds Cheetah Breeding Project is based at Emoya Estate just outside Bloemfontein. Riana van Nieuwenhuizen bought her first cheetah, Fiela, after working with Friends of the Zoo for years. Realising the predicament of the cheetah, she dreamed of establishing a sanctuary for cheetahs to educate people and save them from extinction. Today the sanctuary has several cheetah, lion, leopards, caracal, servals and wolves. The animals born here live in the 10-hectare sanctuary as part of the research and cheetah breeding project. The king cheetah, now in evidence at the De Wildt Cheetah and Wildlife Centre, has distinctive skin markings, as opposed to the usual spots. We had an interesting time at Dell Cheetah Centre. Moholoholo also allows you to pet a cheetah while on a tour of their rehab centre.